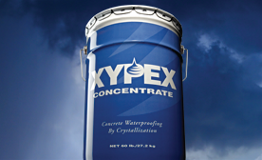 Xypex Concentrate is the most chemically active product within the Xypex Crystalline Waterproofing System. When mixed with water, this light grey powder is applied as a cementitious slurry coat to above-grade or below-grade concrete, either as a single coat or as the first of a two-coat application. It is also mixed in Dry-Pac form for sealing strips at construction joints, or for the repairing of cracks, faulty construction joints and honeycombs.